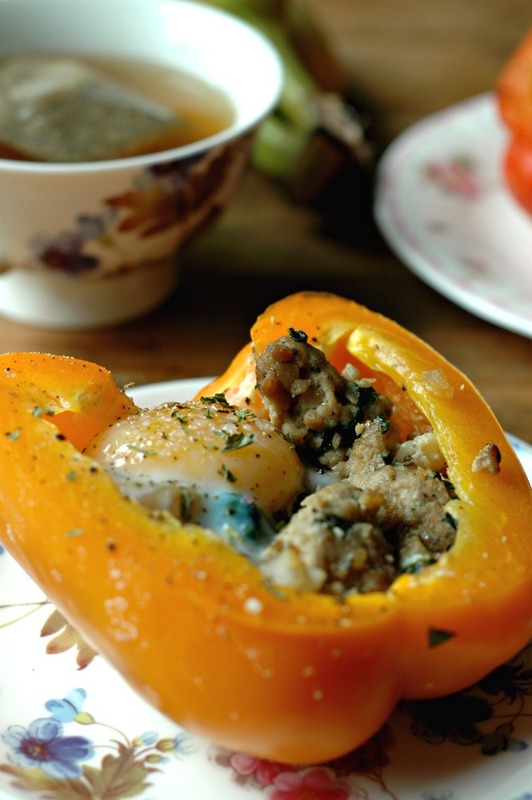 Every bite you love about breakfast packaged into perfect little breakfast stuffed peppers! 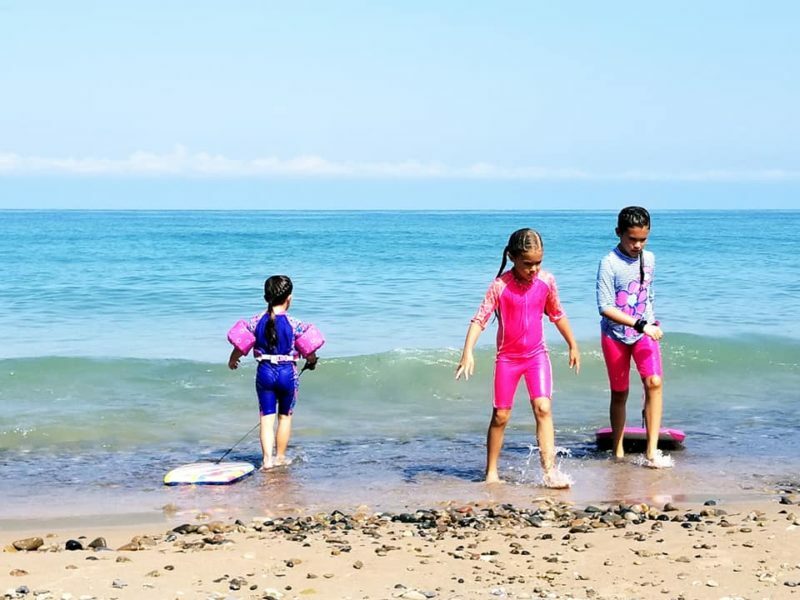 Ahhh…we are literally soaking up every last ounce of summer beach time that we can before those school doors open! There’s still plenty of warm weather left, but these last few weekend escapes have me savoring as much of sweet summer as I can! 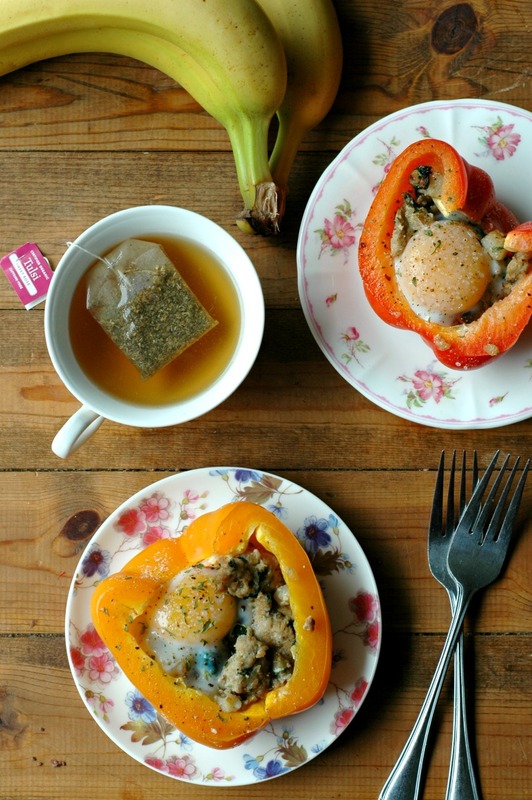 This fun stuffed breakfast pepper idea has become a weekly staple in at our table this summer. While it might not necessarily be school morning friendly in prep time, it will definitely hop onto my weekend rotation for the school year, because the girls really love them! Breakfast hash leftovers that is! Tuesday’s are breakfast hash days here at my house (you can see my school weekday breakfast rotation HERE – it looks a little different these days, but is similar). I made more than I needed for one breakfast one Tuesday, with thoughts of using the leftovers for my breakfasts in the coming days, but ended up not using it. I found it in the fridge a couple days later, and decided to try making it into something new! Everything you love about breakfast, in one happy place! Little kids love little packages. I think sometimes we overwhelm little ones with huge portions and so many choices, that they end up shutting down. Little bites of potato, egg, sausage, and pepper in one pretty little pepper cup is such a great way to get a variety of food groups into little kids! 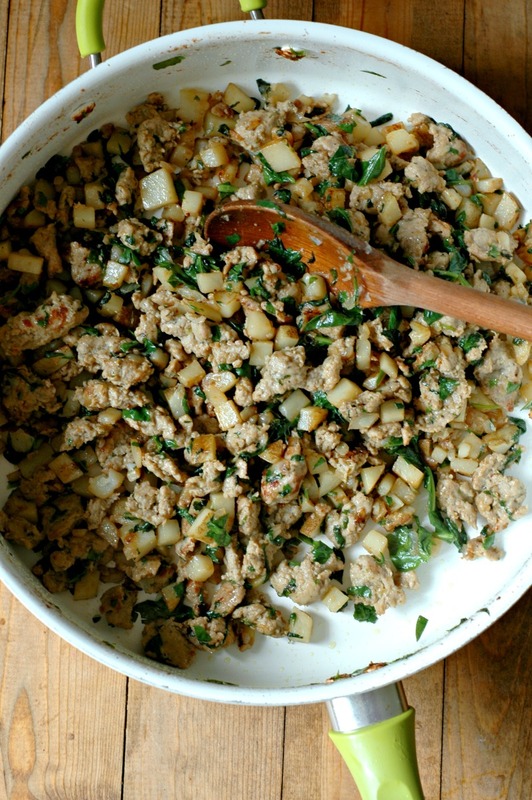 Use whatever sausage you love using for this ingredient. If you have a favorite farmer or good quality, clean store-bought brand, use what you and the kids like to eat. We have a local farmer I love to get ground pastured pork from, and I season it with my own Sausage Season Blend. Or we get the organic ground turkey from Costco, and season that with that same DIY sausage season blend. That is up to you! 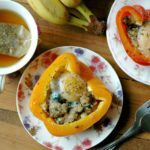 The best part about these little pepper cups, is that you can customize each pepper to how your kiddos like their eggs. My household is pretty split! One of my girls and I love a drippy yolk to stir into our pepper cup, while the rest of the family prefers scrambled. Do what works for you! Make the hash ahead of time. You can make it the night before, or on your prep day and stash it away. Then all you have to do is stuff the peppers and into the oven when you want to bake them off. Make the hash work double time! Double the hash and serve half of the hash with extra veggies and a side of eggs or some shredded cheese, and save the other half of the hash to stuff the peppers with later in the week. 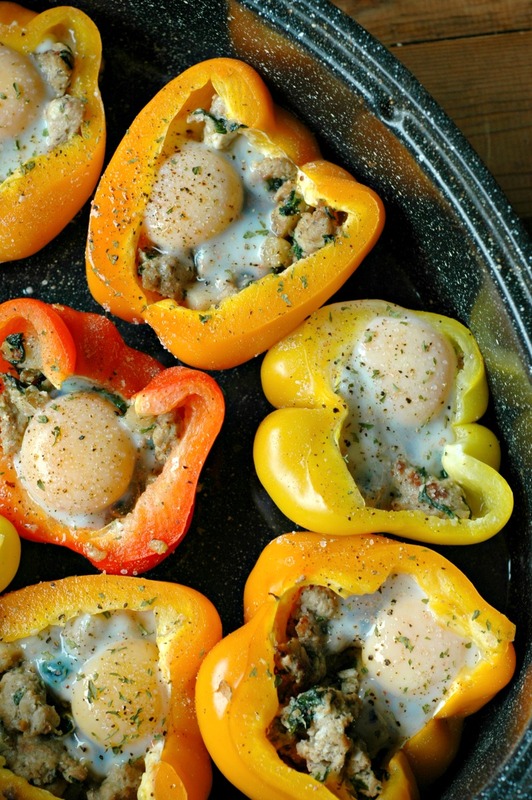 Larger peppers are easier to stuff and fit a whole egg into. Make sure to dice the potatoes small so the hash fits every nook and cranny! Leave room for the egg when you are scooping the hash in. If you are doing a sunny side up egg, I have found that poking the egg white membrane near the yolk to break it up a little helps with it cooking all the way through the best. I have tried cooking this so many different ways this summer. From sheet pan prep, to a lidded pan, the yolky eggs really cook best with a lid. I am not a fan of using aluminum foil, but if all you have is a baking dish, then that should be fine. If you have a casserole dish with a lid that is large enough, that works, or I used my large roasting pan with a lid with the best results. Heat a large skillet over medium-high heat, and add the butter to melt in. Add the sausage and onion cooking until the sausage is almost browned, about 3-4 minutes. Add the garlic and potatoes and cook until the potatoes are browning and cooked through, about 10-15 minutes. You can pre-heat your oven at this point as well. Add the spinach to the skillet and cook for one minute, and then turn the heat off. If you are prepping ahead, your hash is done at this point, and you can cool it, and store it away until you are ready to use it. Put 1/2 cup of water in the bottom of a large casserole dish or roasting pan that has a lid. 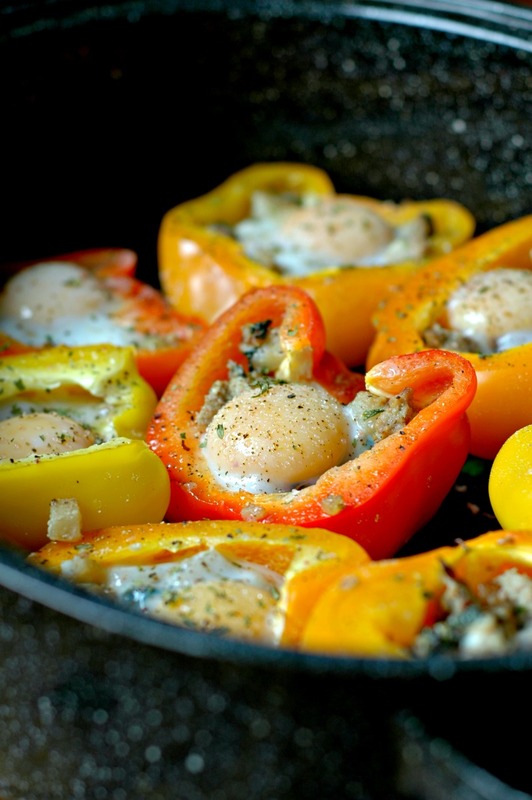 Place the bell pepper halves in the bottom of the pan, and fill each pepper with hash. Be sure to leave enough room for the egg! 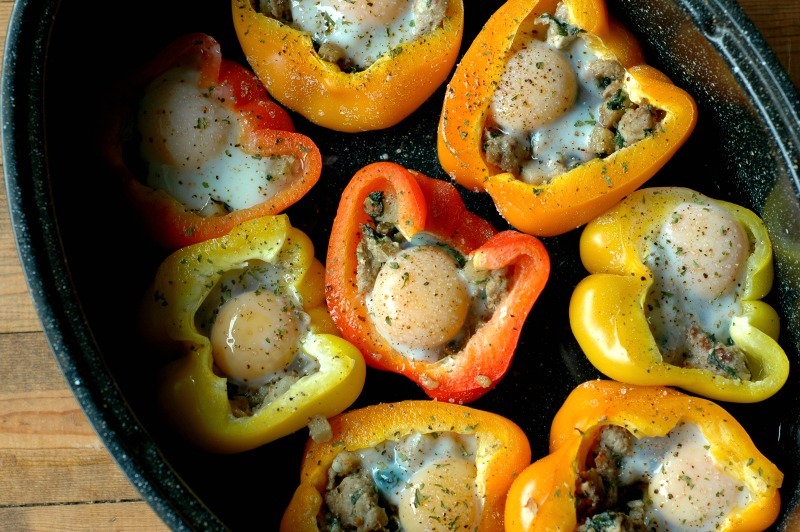 Crack an egg into each bell pepper, on top of the hash. Or, you can scramble the eggs and pour them into each cup if that is how your family prefers eggs! Put the lid on your pan, and bake at 350 degrees for 25-30 minutes for sunny-side up eggs, or 30-40 minutes for scrambled. Check the peppers at the minimum times so you can be sure the eggs are set to your liking. You can take the lid off the pan for the last 10 minutes to melt cheese up top if you want too! Sea salt and pepper the tops as well as garnish with parsley if you wish. I love this idea! Everything stuffed into the perfect little edible cup – the best! So fun for kiddos and the whole family. These ourselves cute and so fun to eat! Such a great way to spice up breakfast when you are in a rut. This is such a great idea! 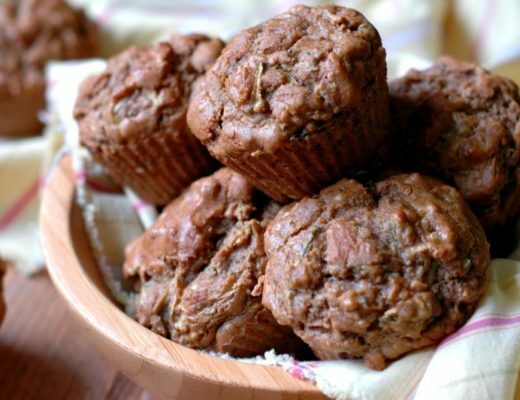 And what a great way to start the morning – just packed with veggies! Loved the sausage has that went inside the peppers!!! We only had a couple of peppers so I ended up making some roasted with the egg and then used the leftover hash the next day as well. Good recipe for make ahead breakies as well. What a great idea, even for brinnner! I have some peppers that are begging to be used up, so this is perfect! That hash looks amazing Renee! And my kids LOVE peppers!! I can’t wait to make these for them, because like you implied, we love and savor breakfast so much, especially on the weekends when my hubby is home. And savory breakfasts are the best! Cute, brilliant, and totally yummy looking. My family would love these. I love all the veggies you pack into this hash. We’re in a little bit of a breakfast rut, I’m so happy to have this recipe! 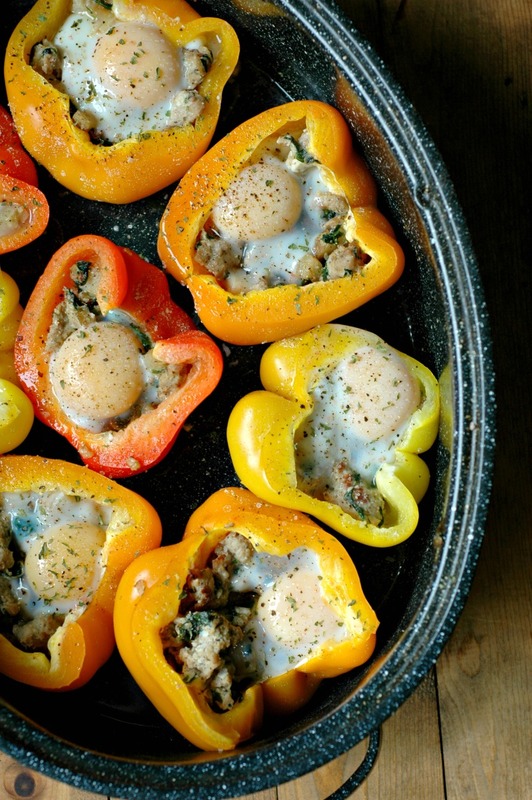 I LOVE veggies for breakfast and cannot wait to try this! This is such a great idea. I am definitely going to try! I love savoury breakfasts loaded with veggies. GENIUS. I cannot believe I’ve never thought of trying something like this! 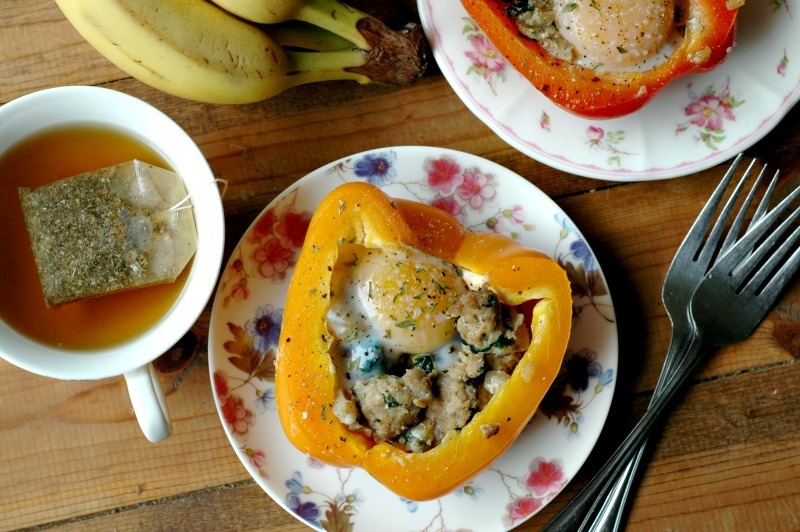 What an absolutely perfect combo of ingredients for a healthy and hearty breakfast!! Totally in love with this dish. So delicious and perfect for breakfast! 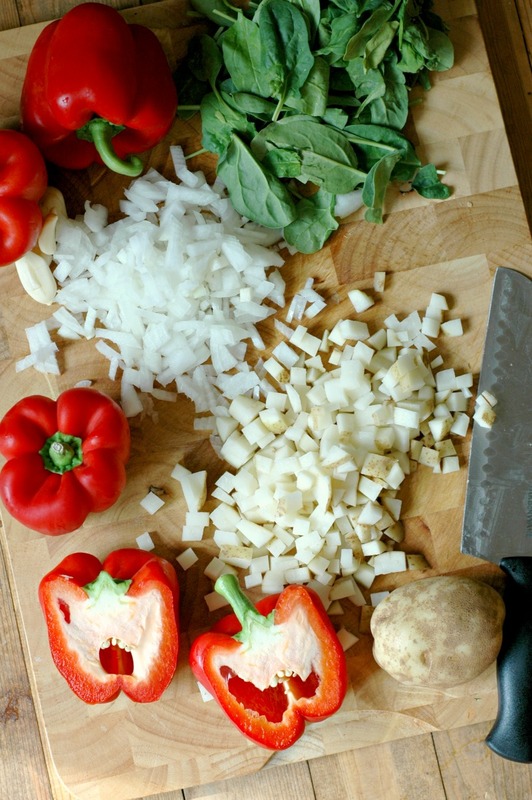 I bet those runny egg yolks provide the perfect “sauce” for this yummy hash! Beautiful and so nourishing! How fortunate that I just bought 8 red and yellow peppers today! What a great idea to serve these in a pepper! I’m going to try this on the weekend! 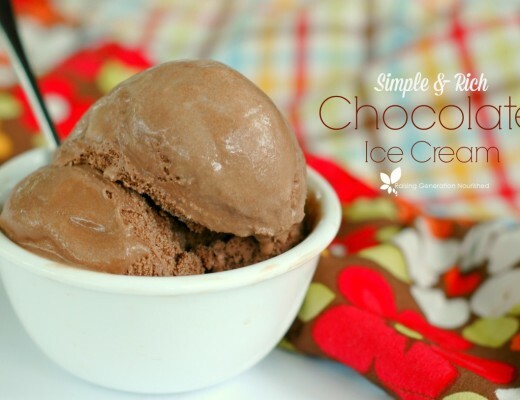 I am going to make this with organic ground turkey or chicken as soon as possible! Thanks for all the great tips and how to make it work well! This is so festive. I will definitely use your seasoning ideas for the ground meat and make that ahead of time. Looks delicious!!! I can’t wait to have eggs again so I can try this! These look so colorful and fun to eat! I love how each one can be custom to help with food issues.